Slow down, breathe in, and gently nurture yourself and your soul at Temenos | Eat. Play. Drink. Cape Town. THAT being said, in the interests of full disclosure and brutal honesty, I find it extremely difficult to switch off and relax. For years, therapists at beauty parlours have pummeled the tension knots in my neck and shoulders while urging me to loosen up. Obviously the more they said that, the tenser I became. Who the heck fails at getting a massage? By the same token, I’ve not had much success with any kind of meditation; emptying my mind of its endless lists of things to do and groceries to buy and errands to be run and interior decorating fantasies proves futile. I haven’t had a crystal or burned incense for years, nor have I stomped barefoot at a trance party while wearing something tie-dyed and sparkly things stuck on my face for well over a decade. To put it bluntly, my pseudo-hippie days are far behind me. 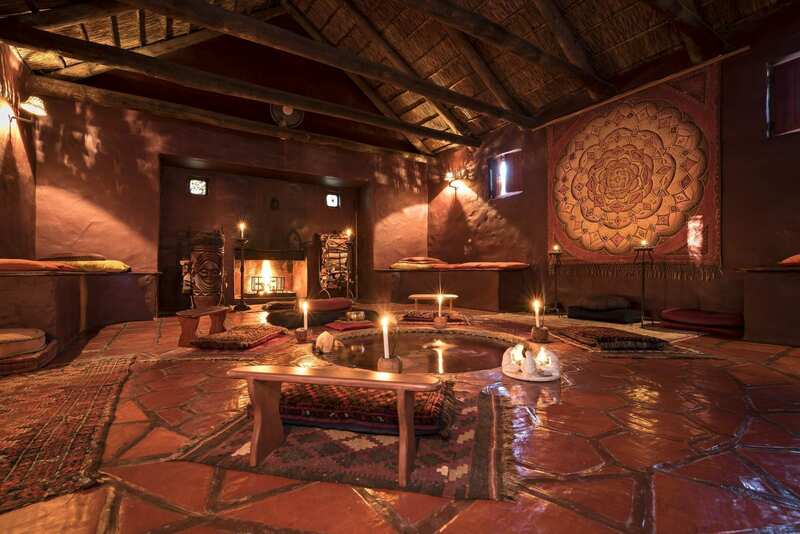 With all this in mind, one might wonder what I was doing at Temenos, a peaceful and tranquil retreat in the heart of McGregor, whose name is a Greek word meaning “a sacred space”. Firstly, it was a birthday gift to my best friend, who claims this place as one of her favourites in the whole world, and I will do just about anything for her. But also, even if I am not the person who seeks out this particular kind of quiet, I still find the environment soothing and pleasing. If all I want is to curl up and read my book without interruptions, this is where I can do that. 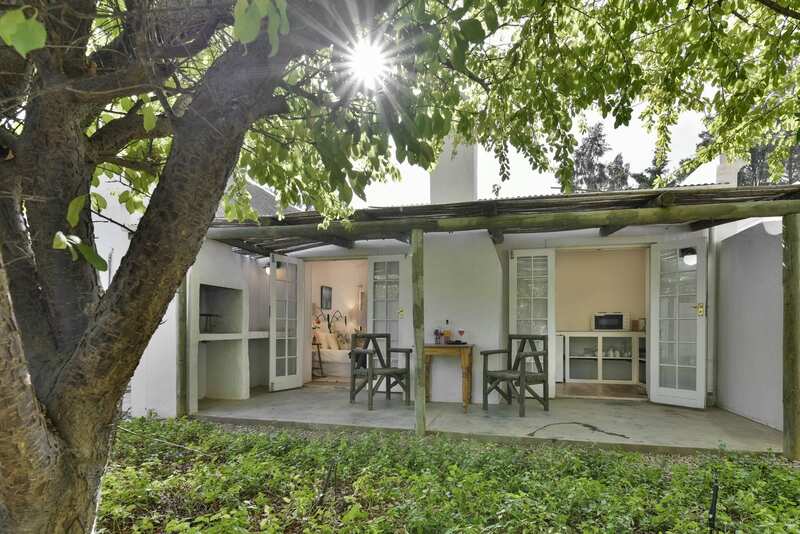 On the grounds are several single bedroom self-catering cottages and units of varying sizes. The accommodation is rustic and comfortable. There are no televisions, no telephones (except your own of course), and don’t even bother with the wifi. Social media is not a priority. The beautiful gardens are extensive and herein lies the most likely point of your stay. There are paths, a labyrinth, a Buddha (and statues of other religious icons), temples, chapels and sanctuaries. You’re invited to remove your shoes and leave them by the door to ensure privacy. Benches nestle between the foliage for silent contemplation. Candles can be lit, intentions can be communicated to the universe, and wishes can be made. Gaze into ponds and wells (or swim in the normal pool), meditate, pray or do whatever you feel is right with your higher being, and emerge feeling refreshed and rejuvenated. You can self-guide or join one of the many workshops or classes held at the retreat. 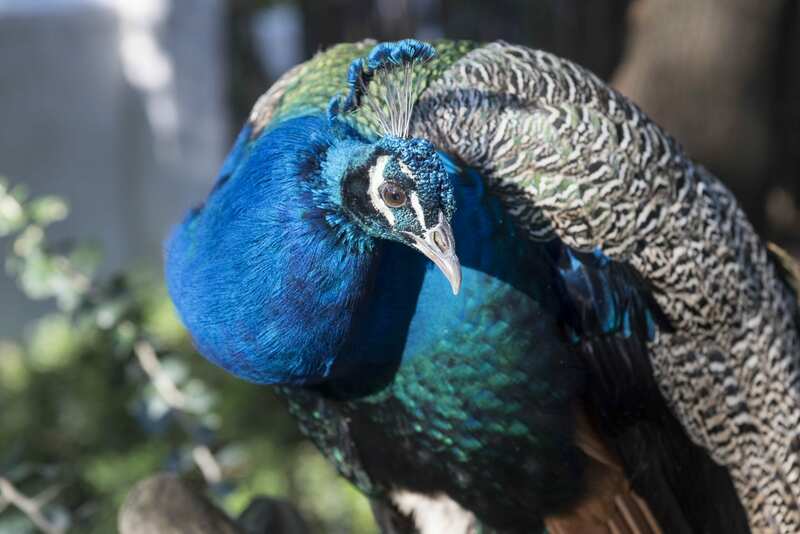 Your space will be shared with various birds – in particular a large number of peafowl, for which the place is famous. The peahens are unremarkable but the peacocks are magnificent. Apparently I can communicate with them, because when we encountered one, I urged him to show us his tail feathers. He eyed me up and down for a moment, then bristled and swept them up into a rustling, vibrating display as he slowly turned circles to make sure we admired him from every spectacular angle. FYI, these birds have a ridiculously raucous cry – a bit like you’d imagine a giant cat in distress to sound – which will make you grateful for hadedahs. We pretty much fended for ourselves in our unit, which had an open plan bedroom and kitchenette, as well as indoor and outdoor fireplaces, and tiny bathroom. 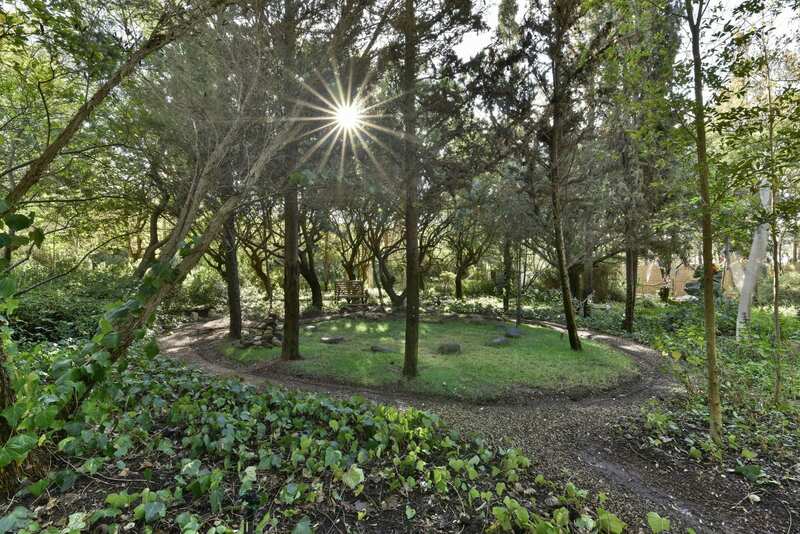 In the morning we strolled through the gardens to the adjoining restaurant, Tebaldi’s, which has indoor seating as well as outside in the front as well as the back overlooking the rose garden. It’s fully licensed and open – for guests as well as the general public – for breakfast and lunch Tuesdays to Sundays, country cuisine for dinner on Wednesdays and Thursdays, and a la carte on Fridays and Saturdays. If you’re staying on a Sunday night and don’t feel like cooking, you can order a take-away. “We believe guests and staff at Temenos do not necessarily need to adhere to a set of spiritual rules, but that our spirituality may be expressed in our own unique ways. Temenos is a sacred space where all are welcome,” says owner Billy Kennedy.